Did you find things in our last study a little interesting? Maybe it did for you what it did for me – it set me free. You see, I spent most of my life trying and trying to do things right. I tried so hard to be perfect, but all I ever seemed to experience was disappointment and condemnation. I was looking in the wrong place for a perfection that the law will be happy with. In the last study, I promised to tell you what the law REALLY wants from us. I will do that in a moment. 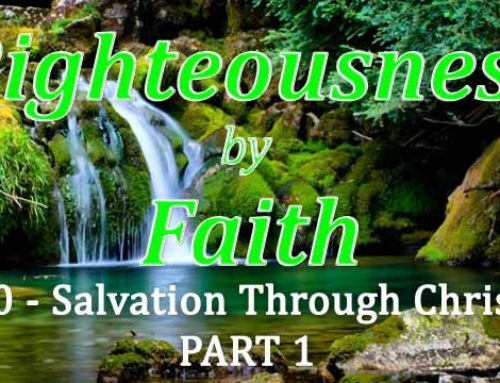 But first, have you ever heard the phrase “Righteousness by faith”? Have you ever wondered what that means? 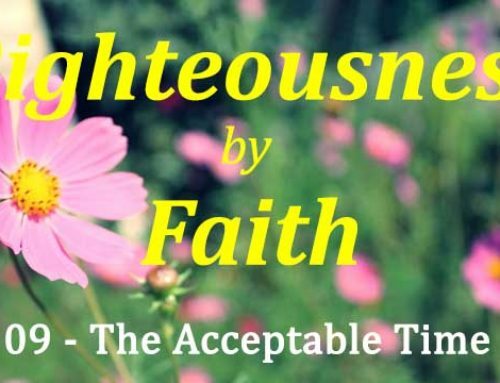 I don’t like to use the typical Christian cliche’s in my presentations, because I have found that often we don’t even know what they mean, but its like we think that as long as we can recite these wonderful phrases, we will be fine. So I try to avoid them. 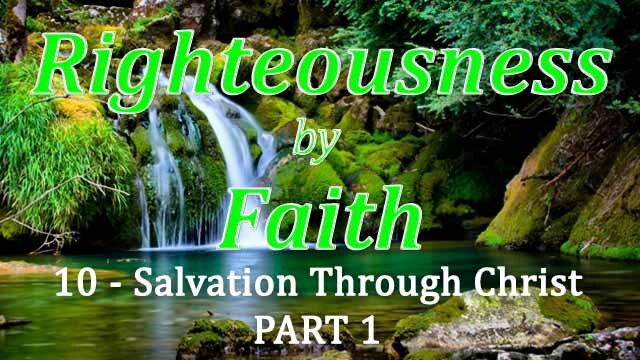 But I am going to use this phrase “righteousness by faith” because its actually a very simple summary of what we are studying. Now, that’s what righteousness is. We don’t need all the theological arguments to explain it. For the sake of keeping things simple, let’s consider righteousness as simply, “right-doing”. Because this is what we need isn’t it? 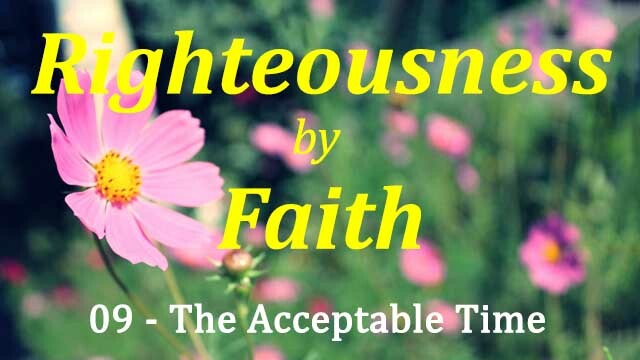 “Right-doing” as in, a right-doing which IS acceptable to the law of God? Because as we have just learned, MY right-doing is not good enough. 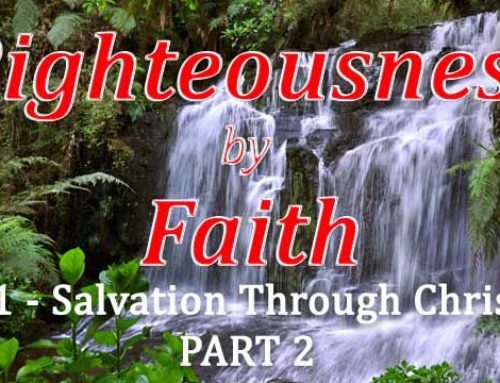 And so, if righteousness is right-doing, let’s think of “Righteousness by faith” as “Right-doing by faith”. If we think of it like this, it will actually make a lot of sense. 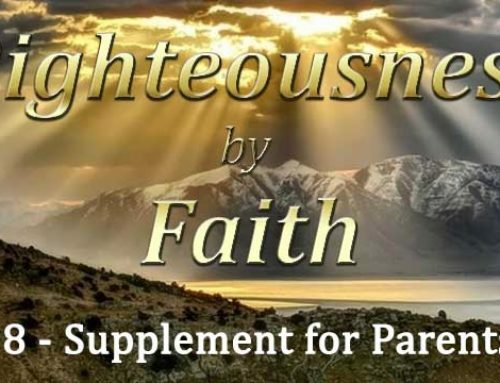 Whatsoever, whatever works we do, that are not the result of faith is sin. 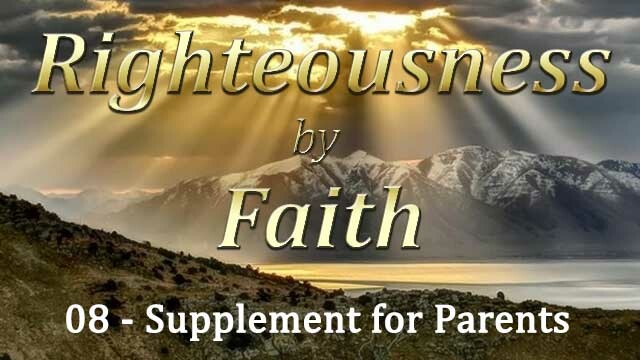 It is by FAITH that RIGHT-WORKS come into our life. And so it is “right-doing by faith”. If OUR works are unacceptable, then what must faith do? It must bring someone else’s works into our life. And whose do you think that is? Are His works good enough? Absolutely His works are good enough. Everything He does is righteous – it is all right-doing. 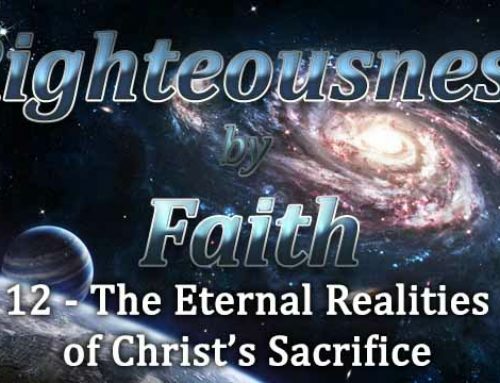 In fact, He is the DEFINITION of righteousness. And the law is a DEFINITION of HIM, and so what does the law REALLY want? AT Jones 1893 General Conference Bulletin 412 and Jones is here speaking of when the law comes to an individual asking for a perfect life. “Well,” says one, “I have not got it. I have done my best.” But the law will say, “that is not what I want. I don’t want your best. I want perfection. It is not your doing I want anyhow; it is God’s I want. 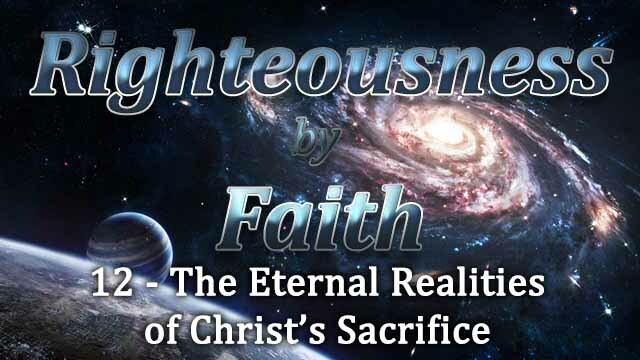 It is not your righteousness I am after; I want God’s righteousness from you. It is not your doing I want. I want God’s doing in your life.” That is what the law says to every man. HAHA! You see? THIS is what the law wants. It DOES NOT want MY obedience. It want’s God’s obedience in my life. And so we can stop looking to our own selves to try and try and try to be obedient and instead start looking to God and asking Him to do the works for us. If it is not the Lord doing the works, it is vanity! Remember what we read last time in Isaiah chapter 64:6? That all of our right-doings is like that filthy rag which symbolises vanity and unprofitablity. In this text, the word, “appointed” comes from the Hebrew word, “khoke”, and it means, prescribed task or action, especially in reference to the law. In just a few words, Job is summarising the things that we are studying: God Himself will perform in our lives the very things that His law requires from us. These truths are so precious to me. I am especially grateful to God for that quotation from AT Jones that spelled it out for me. The law does not want my obedience! When we discover that we no longer need to depend on ourselves, it brings relief. Year after year we try to work thing out ourselves, but all we seem to do is get further away from where we want to be. And how stressful is that? Especially when you can see how little time we have left to be ready for Jesus Second coming! BUT if GOD does the works, then what is there for me to worry about? Absolutely nothing! Lord, thou wilt ordain peace for us; for thou hast wrought all our works in us. How many works? ALL our works! And this is God’s gift of peace for us. He doesn’t want us stressing and worrying about ANYTHING. Not even our salvation! Because if we will just let go and let Him do the works, then we have everything that we need for today, everything we need for the time of trouble tomorrow, and we have a perfect obedience in this time of judgment that the LAW is VERY HAPPY with! There are many things in our lives that need to change. And many times we worry about what our family or friends might think when they see us changing our diet, or the way we dress, or anything else that God wants to do. BUT if it is God doing the works, and anyone has a problem with it, we don’t have to take it personally. I DIDN’T DO IT!!! If they have a problem, they can go and take it up with God because He was the one who did it! If God does the works, the consequences are for Him to deal with – not me! And so there LITERALLY is NOTHING for us to worry about when God does the works. NOTHING! Did the Apostle Paul ever stress about anything? He was even shipwrecked in a storm! Yet, he had perfect peace through all of his experiences. Why? Sometimes I wonder how many times God has had to watch me make a mess of my life. And He has been standing there, wanting to do the works for me, and I say, “Nah, I can do it.” And so I go ahead and make a mess of it. And then He says, “I will clean it up for you.” And I say, “Nah, I can do it. I made the mess, and so I will clean it up!” How much I have grieved the heart of God! If only I had let go and let Him do it for me, how much easier life would have been. Not just for me, but for those around me also. 12| Wherefore, my beloved, as ye have always obeyed, not as in my presence only, but now much more in my absence, work out your own salvation with fear and trembling. 13| For it is God which worketh in you both to will and to do of [his] good pleasure. We read verse 12 and we think LOOK! I need to work out MY salvation! And so we try to. And is it not with FEAR and TREMBLING? Constantly trying, constantly failing, constantly under the fear of condemnation? But we FORGET verse 13: It is God which works in us BOTH to will and what? To DO of His good pleasure. The fear and trembling it is talking about in verse 12 is the fear that we will be doing our own works! When we awake in the very morning, our first prayer should be, “Lord! Don’t let me do my own works today! Please, can you do it!” And this needs to be our heart’s prayer constantly through the day, moment by moment, whatever needs to be done that day, putting on our socks, brushing our teeth, or meeting some huge trial in the workplace, and especially battling with temptation against sin. “You do it, Lord. I can’t!” And God loves to do for us the things we cannot do for ourselves. God doesn’t want us stressing about anything today, or worrying about anything tomorrow. He wants us to have peace. Even in the time of trouble that is ahead of us. And so He is offering us His own works as a gift. Moment by moment, let go of our own selves, and let Him do the works. 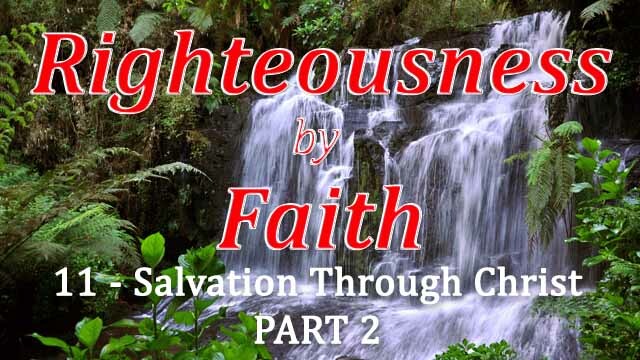 Righteousness by faith is simple. It is right-doing by faith. Only God’s works, not my works, are acceptable to the law of God. And so faith must bring into our practical reality the perfect right-doing of God. In our next study, I want to illustrate these things in a very powerful way. I will show you that after thousands of years, we still haven’t learned from the mistake that the Israelites made. In fact, we will see that we haven’t even learned from the mistake that Satan made when he was in heaven! Continue with me on our journey of discovery. I will see you next time.